Online shops managers are always worrying about missing potential sales, They do a lot of things to their websites to enhance customer acquisition and to reduce the rate of carts abandonment. One of the things that makes the customer abandoning the cart is the payment options available in your store. Some customers may don’t have access to PayPal or can’t pay with their credit card or even they don’t have one. 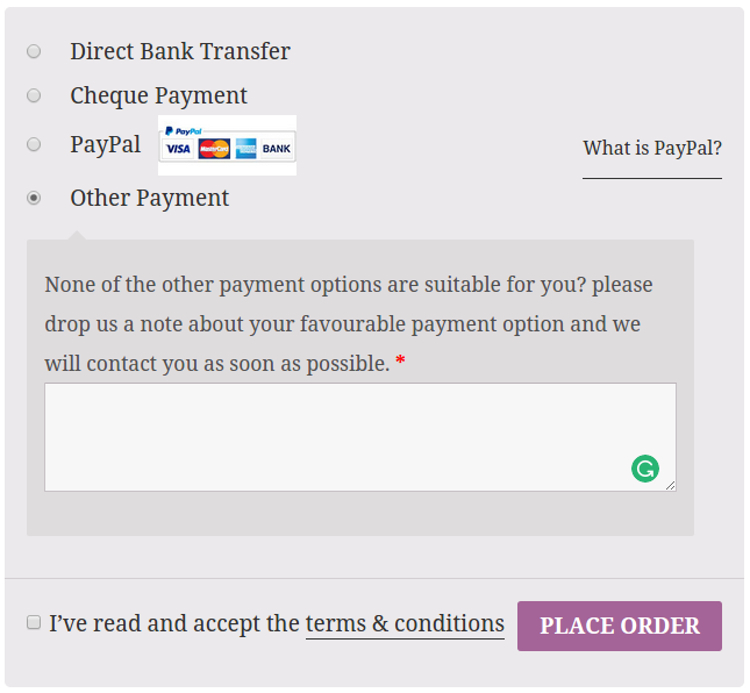 I was thinking about this problem because I live in a country where online payment options are very limited and I decided to develop a WordPress plugin to solve this issue. I made a WooCommerce Payment Gateway and I named it “Other”. Honestly, I don’t like the name and please if you have a better name drop me a comment. Anyway, I made it as simple as I can. If the customer couldn’t find a suitable payment option he would click on “Other” and a textbox will appear to let him write to the shop manager his favorite payment option. The shop manager would call him or follow-up with an email after that. To this point, the store won’t miss a single sale because of the payment options availability. I hope this plugin would solve a small part of a big problem in the world of e-commerce. You can download the plugin from the WordPress repository, or you can fork it on Github. I will welcome any pull-requests to improve the plugin in the future.